Post Tagged with: "timeshare destinations"
We have provided the favorite timeshare destinations in Mexico below. Once you have read about all the perks you can enjoy at each of these favorite timeshare destinations in Mexico you will want to book your vacation quicker. It seems that everyone that comes to Puerto Vallarta instantly falls in love with everyone’s favorite timeshare destination in Mexico. The city is situated around lush greenery and majestic mountains. Sunbathing and swimming is ideal at Banderas Bay. Eco tours allow visitors to explore the nature here, but if you would rather indulge in delicious foods, then Puerto Vallarta is the place for you. Puerto Vallarta is a food lover’s paradise as there are many different dining options from enjoying a meal at 5-star restaurants to taco vendors located on the streets of Puerto Vallarta. Art lovers can go to the art galleries in downtown along with shopping, but one thing that this city is known for is its lively nightlife. The hustle and bustle of Puerto Vallarta can be left behind when you spend your vacation at Riviera Nayarit. You can kick back and relax on the beachfront where you can watch the Pacific Ocean waves gently hit the shore. If you are worried about getting to this city, then you shouldn’t because you can get here by taxi and it’s just a short drive. Lounging by the pool, swimming, surfing, and snorkeling can be enjoyed when you get here, then you can let loose when night arrives as there are many parties downtown or you can choose to party on a sunset sailing adventure. Cancun is a fabulous place with a large variety of things to see and do. 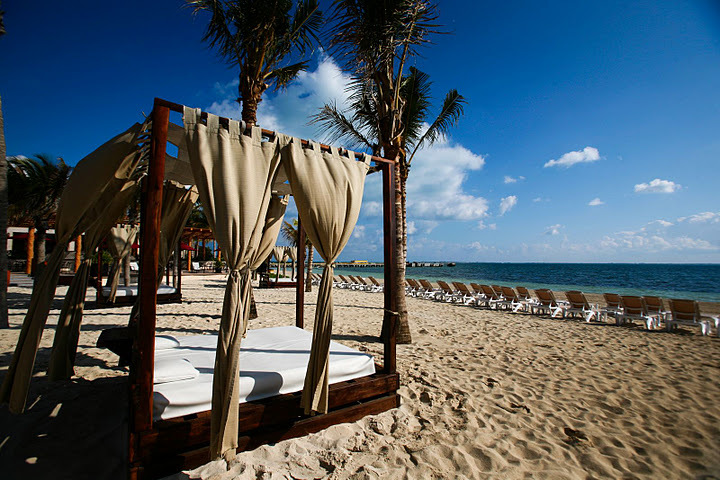 Cancun is located on the Caribbean coast and they have amazing white sandy beaches. Learning about the history of Cancun can be done by visiting the Mayan architectural ruins or you can do this at Uxmal, Tulum, and Chichen Itza. Dining, relaxing, or shopping makes a great day in Cancun. The natural and beautiful landscape, crystal turquoise waters so clear, stunning desert scenery, and the soft, white sandy beaches are just a few things that visitors can enjoy in Cabo San Lucas. A must see in the city is the El Arco Rock Formation where in the background visitors will see the mountains peering. Cabo San Lucas has become very popular and a favorite destination, and when you arrive you will see why. Once you discover the nightlife, outdoor adventures and activities, golf courses, and gourmet foods you will find it hard to leave Cabo San Lucas. Floating on a raft on the Sea of Cortez is a favorite pastime for visitors as you can look through the clear waters to see the schools of fish swimming and the vibrant reefs and marine life too. Activities above water can be done when you are done floating and lounging on the water. You can dine out and order the catch-of-the-day for dinner or you can even order the chocolate clams that is a favorite dish in the Islands of Loreto. What’s your favorite timeshare destination in Mexico? During the hot summer months when vacationers and travelers are relaxing in the warm weather and have their guard down is a prime time for scammers to operate. You may be visiting an unfamiliar town where you are more likely to be targeted by scammers. There are numerous scams and some of the more common ones to look out for are set out below. This is a common practice, not limited to summer scams which is usually operated by shop staff or taxi drivers. It involves conning you out of your rightful change. You pay for your service with a note, and quickly they will drop a lower value bill and suggest you have not given them enough money or they will give you change for the lower currency bill. The way around this is to make sure you say to them the value of the note you are handing over. These involve the renting of summer vacation properties. Adverts can be placed in local newspapers or on non vetted websites offering rental properties last minute at maybe bargain rates. On answering the advert, you will be asked to pay for the rental in advance by a wire transfer as they will not accept a credit card. This is the scam as when you arrive at your rental, you will find that it is an invalid address or someone (owner or tenant) is in the property and knows nothing about any rental agreement. You have been scammed and the renter is off enjoying the high life on your money. Beware these kinds of summer scams. If you have had a long trip to your vacation destination and have arrived late at night when all the restaurants are closed, you sometimes are hungry and want some food. Beware, because scammers can operate in this situation as well. You may have been handed a flyer or have one pushed under your door advertising a late night delivery service. You call the number, place your order and pay by credit card as they do not accept cash on delivery. The food does not arrive, and when you call the number again you get no reply. The scammers have your credit card details and are then free to make purchase using your card information. This is another common summer scam which usually happens late at night. You check in at your hotel giving all the usual credit card deposits and information. You are tired and go off to bed. The phone then rings claiming to be from the hotel reception desk, querying some of your credit card details or saying your card has been declined and can you confirm the details or give particulars of another card. Sleepy and fatigued from your trip, you do so. In the morning, when fresh, you check with reception and they confirm that they did not make any call. Scammers have got your card info and potentially can scam you out of a lot of money. Beware of Wi-Fi scams. Most vacation locations like bars and public places have many opportunities to log on to free Wi-Fi services. Remember though that it may be free but it may not be secure. Scammers can set up counterfeit networks which will be able to steal your email details and maybe even your online banking details.